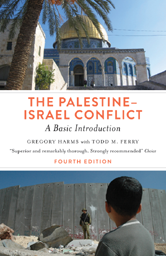 Editor/Author Harms, Gregory and Ferry, Todd M.
The Palestine-Israel Conflict provides a balanced, accessible, and annotated introduction that covers the full history of the region, from Biblical times until today. Perfect for the general reader, as well as students, it offers a comprehensive yet lucid rendering of the conflict, setting it in its proper historical context. This fourth edition brings us up to date, and includes recent events such as Israel's Operation Protective Edge, developments between Fatah and Hamas, ongoing Palestinian resistance, and the entirety of the Obama years.